Mother Nature can create the most awe inspiring shows of both great beauty and severe destruction. Unfortunately, our homes are often caught in the crossfire of her wrath. For storm damage repairs, North East Home Improvement provides great service at a great cost! North East Home Improvement is equipped to handle damage due to severe weather. Whether your home has been damaged by wind, rain, lightning, or snow, we offer the materials and quality workmen to repair damaged sections to their former condition. We strive for the best customer service and repair work with minimal interruption to your home life and busy schedule. In addition to repairs work we also offer emergency services and cleanup due to storm damage. We can immediately provide tarps and emergency board up to protect your home and family until repairs are completed. North East Home Improvement has the experience to tackle water and wind damage, tree removal, and structural stabilization. With customer service always a priority, we are committed to make fair storm damage assessments and to keep repair costs affordable. We know this can be a devastating time for you and your family and will do everything in our power to make the process of restoring your house as easy as possible. If you are in need of such services, don't hesitate another moment! Call North East Home Improvement now to find out how we can help your home and life return to normal. North East knows Mother nature always finds a way to ruin something nice. We understand that these unexpected expenses can come out of nowhere. We work with your insurance company to help make it feel like nothing was ruined in the first place. If you’re not covered for the damage we can provide special financing to help soften the blow of these devastating accidents. Gutters filled up with ice and roof backed up with snow? 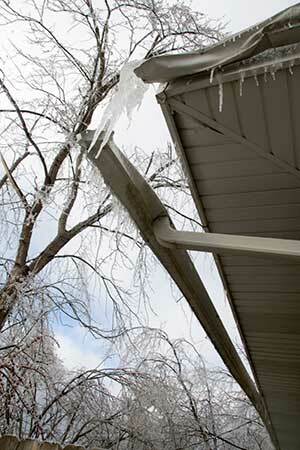 This can lead to major problems for gutters and roof from bending and warping to a total collapse. Don't hurt yourself trying to remove it with the wrong tools, let us help. 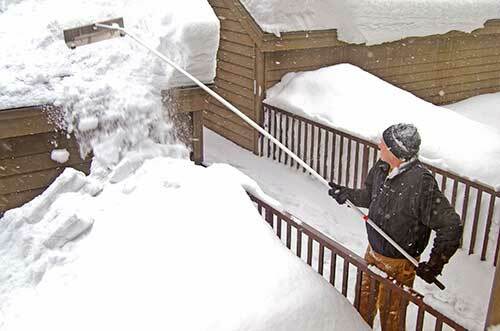 We have special equipment to make it safe and easy to remove backed up snow and ice.